When I was twenty-three I worked at a local preschool. One day I left early to drive up the highway (to do what I can't remember), and I stopped at a pumpkin patch along the way. I ran into one of the teachers who used to work at the preschool: she was on a field trip with her new classroom to pick pumpkins for carving. She told me all about this new school she was working at, how orderly the activities were, how independent the children acted, how there were so many great subjects for them to choose from, like math and geography and music and art, and lots of language, and she raved at how smart the kids were, and how they loved to learn. Wow, it must be a school for gifted children! I stated. No, she replied, it's a Montessori school. I never heard of such a school. She told me all about the special training class she was taking in San Francisco, two nights a week, as we strolled amongst orange pumpkins and yellow green vines and leaves, with the voices of happy kids in the background. You have to come to one of our training classes! I think you would love it! And they need more people to work at the Montessori school. She told me with excitement. 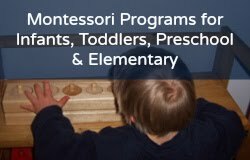 To make a long story short, I went to her training class, fell in love with Montessori, and signed up for the two-year training course, quit the preschool, dropped all my college courses, and started working at the new Montessori school. And whenever I drive by a pumpkin patch in the lovely fall season, I remember running into my fellow teacher friend and how her enthusiasm for Montessori swept me up... and here I am! Still passionate about Montessori!